What is an Automated External Defibrillator AED and how does it work? An automated external defibrillator or AED is a portable electronic device that automatically diagnoses the potentially life threatening cardiac arrhythmias of ventricular fibrillation and ventricular tachycardia in a patient, and is able to treat them through defibrillation, the application of electrical therapy which seeks to stop the arrhythmia, allowing the heart to re-establish an effective rhythm. AEDs are designed to be simple to use for the layman, and the use of AEDs is now taught in many first aid, first responder and basic life support (BLS) classes. With simple audio and visual commands, AEDs are designed to be simple to use for the layperson. There are many Automated External Defibrillator units available in public places such as train stations, shopping centres, airport and leisure centres. These defibrillators are often known as public access defibrillators (PAD) as anyone can use them in an emergency. The location of a public access AED should take into account where large groups of people gather, regardless of age or activity. Children as well as adults may fall victim to sudden cardiac arrest (SCA). In many areas, emergency vehicles are likely to carry AEDs, with some ambulances carrying an AED in addition to manual defibrillators. Police or fire vehicles often carry an AED for use by first responders. Some areas have dedicated community first responders, who are volunteers tasked with keeping an AED and taking it to any victims in their area. AEDs are also increasingly common on commercial airliners, cruise ships, and other transportation facilities. High-rise buildings are densely populated, but are more difficult to access by emergency crews facing heavy traffic and security barriers. It has been suggested that AEDs carried on elevators could save critical minutes for cardiac arrest victims, and reduce their deployment cost. The UK Resuscitation council estimates that there are around 30,000 cardiac arrests in the UK outside of hospital every year. So knowing how to perform CPR and increasing the number of AED’s available in public places will directly increase the survival rates of cardiac arrest victims. The scientific evidence to support early defibrillation is overwhelming; the delay from collapse to delivery of the first shock is the single most important determinant of survival. 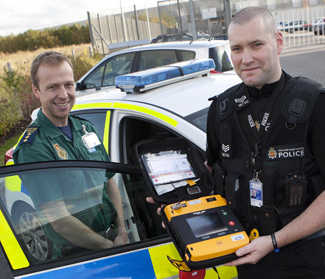 If defibrillation is delivered promptly, survival rates as high as 75% have been reported. The chances of successful defibrillation decline at a rate of about 10% with each minute of delay. Whilst there are many different types and manufacturer of the Automated External Defibrillator AED the fundamentals are the same. When the unit is switched on a voice will talk loudly telling you what to do with clear and simple instructions. Pads are stuck onto the casualty’s bare chest and the AED will receive information about the heartbeat which it then analyses to see if a shock can be delivered. If it can the AED will charge itself. No one must be touching the patient when the shock is delivered which typically happens at the press of a button. In some countries, and in most states in the USA, ‘Good Samaritan’ legislation protects those who go to the help of others. No such legislation exists in the UK, so many people’s first major concern is the legal situation of those who attempt to resuscitate someone. Might a potential rescuer be sued after trying to resuscitate someone who has collapsed? The short answer is that it is very unlikely that a potential rescuer could be sued. In English law, for someone to be held liable it would have to be shown that the intervention had left the victim in a worse situation than if there had been no intervention. In the circumstances under discussion (i.e. someone who is technically dead following a cardiac arrest) it is very unlikely that this would arise. No case brought against someone who tried to provide first aid has been successful in the UK, where the courts have tended to look favourably on those who try to help others. There are advantages in having a core number of appropriately trained personnel in the workplace. Training people to use an AED can be achieved quickly without major cost. Providers of training include the ambulance service and first aid organisations. The use of an Automated External Defibrillator is now included in the 1 Day Emergency First Aid at Work and the 3 Day First Aid at Work syllabus. Choice of training provider will depend on what is available locally, the numbers being trained, and the pre existing level of expertise of the trainees. Clearly, skilled first aid at work employees will usually need less training than those with no first aid knowledge or experience. Did you know we offer accredited training for Basic Life Support and Safe Use of an Automated External Defibrillator AED and can be delivered directly in your workplace. Please email us or alternatively, call us on 01978 359 441 or 0151 515 0416 and speak with one of our training Consultants.